A Muslim Malay, Halima Yacob is set to be formally nominated as Singapore’s first female president on Wednesday. 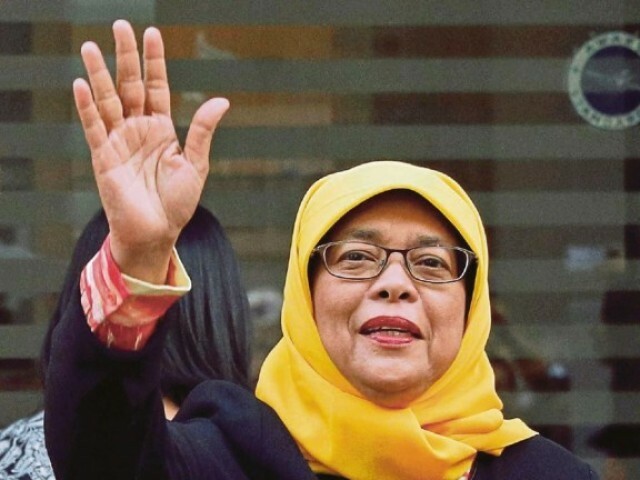 Halimah Yacob, a former speaker of parliament from the city-state’s Muslim Malay minority, will be the first woman to hold the largely ceremonial role if – as expected. But the 63-year-old will avoid an election originally slated for September 23, as others hoping to run against her were judged by authorities not to have met strict eligibility criteria. Singaporeans on Tuesday poured scorn on the process to select their new president, an establishment figure, deemed the only eligible candidate, meaning no election will be held. Five people had expressed an interest in becoming president of the tightly-controlled, affluent nation of about 5.5 million people. Two were disqualified as they were not Malay – the presidency was on this occasion reserved for members of the ethnic minority – while two Malay businessmen were disqualified as their companies were too small. “All Singaporeans are unhappy that meritocracy and electoral fairness, core Singaporean values, have been eroded to fulfill perceived political goals,” writer and political commentator Sudhir Thomas Vadaketh told AFP. There was criticism of the process on social media, with Facebook user Hussain Shamsuddin commenting: “As a citizen of this democratic island nation, I’m deeply embarrassed.” “Don’t call it an election if we Singaporeans can’t vote,” wrote Fazly Jijio Din on Facebook. If a Muslim elected a leader in non Muslim majority is a Progressive liberal Muslim forsure. It us impossible a extremist Muslim can be elected. Progressive Islam is the true Islamic teaching, religion of peace and mercy. Please join Progressive Islam in order we can achieve and show to international communities that Islam is religion of mercy for mankind, can be a role model among society. Gongratulation HALIMAH YACOB.